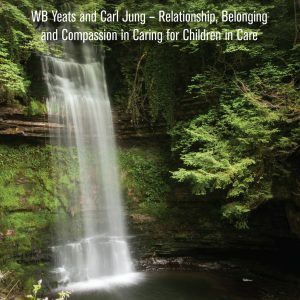 During, and after, many of the incidents and daily life events I have been involved in over my years of social care practice very often I was not traumatised or fatigued but I did connect with and re-experience some of my own vulnerability by connecting with the vulnerability of the children and young people (and occasionally my colleagues). This concept of Vicarious Vulnerability allows for recognition of workers’ own pre-existing vulnerability to be recognised as part of this condition and thus the young person is not solely responsible for workers’ experiences. This is a perspective I find helpful in my practice as it lessens the tendency towards judgement and blame. I have found that reflective process has become part of my self-care regime which, together with supervision and talking to trusted colleagues, enables me to process the feelings arising from such encounters with vulnerability. Additionally, there is another concept relating to compassion that warrants consideration here, this being Compassion Satisfaction. According to Phelps et al. (2009), Compassion Satisfaction refers to the positivity involved in caring for others and it is often gauged by the Compassion Fatigue and Satisfaction Test (Stamm, 2005). Simply put, Compassion Satisfaction involves “the ability to receive gratification from caregiving” (Simon, Pryce, Roff, & Klemmack, 2006:6). 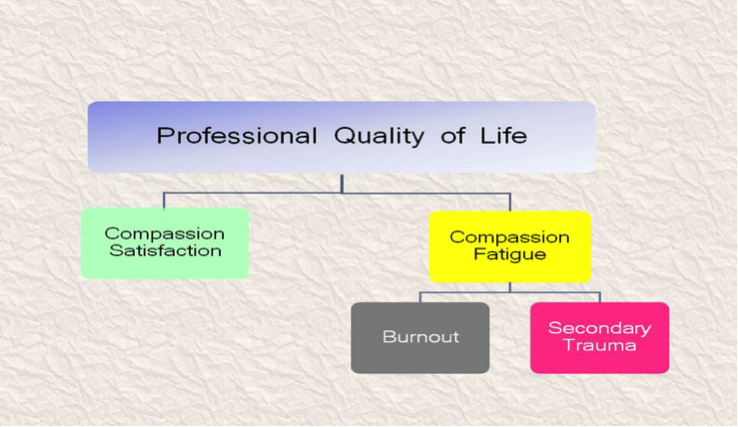 Compassion satisfaction has the potential to counter-balance Compassion Fatigue, Secondary Trauma and Burnout. In the event the professional does experience trauma it is not alone possible that this trauma can be resolved by following the actions outlined above but, in fact, following such recovery the professional may grow both personally and professionally from the experience of the effects of this trauma, by both its endurance and remedy. This has been identified as Post-Traumatic Growth by Calhoun & Tedeschi (2013:6) who define it as “The experience of positive change the individual experiences as a result of the struggle with a traumatic event”. There is no guarantee that Post-Traumatic Growth will occur yet for those where it does the paradox is they may be more vulnerable, yet they are stronger. They have experienced adversity and survived so whilst they are more aware of the potential for adversity to revisit them they are also more confident, based on their experience, that they will survive it should it re-visit them. Furthermore, by understanding and learning from vicarious traumatisation workers can experience vicarious transformation. “Listening to the life stories that clients tell them may change clinicians in a variety of positive ways” (Calhoun & Tedeschi, 2103:141). I have oftentimes struggled to maintain the levels of self-discipline required by traditional mechanisms of self-care and have found that these mechanisms became another task I had to accomplish, and often outside of my working hours. This then tended to make me experience an increased work-related burden which was counter-productive to the goals of the exercise. It felt uncomfortable to me to have to have a self-care regime that necessitated me having to undertake prescribed actions in what is my own time; increasingly scarce time that I greatly enjoy as unstructured and with my family as much as possible. I began to recognise that I have consistently been more successful in recognising the strength, resilience and hope of those children and young people I have cared for than I was at following prescribed regimes of self-care. This requires little discipline on my part, merely compassion, and, most importantly, it recognises that it is the relationship between worker and child that is the source of greatest strength for both parties. Consequently, this approach to self-care promotes best practice on the part of the worker where the work becomes the cure. It affords a self-fulfilling mechanism of positive relationships between worker and children and young people where strengths are identified and developed and shared. However, the relationship-based approach does not preclude employing the techniques identified by traditional self-care approaches as a strengths-based approach does not ignore deficits. Rather, it offers a complementary approach which if combined with these other techniques affords the professional optimum protection from these traumas.